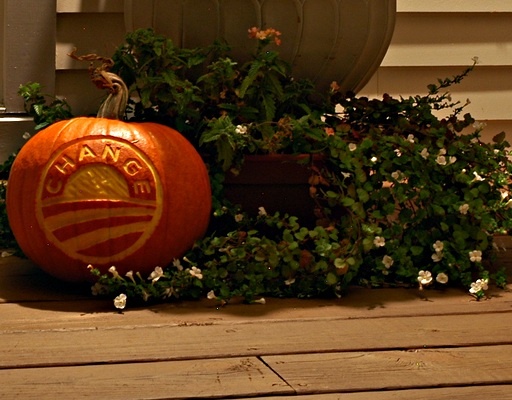 Let’s be clear… we talking about carved gourds here, okay? Tonight I heard it from *all* the folks who were walkin’ their little ones down the candy gauntlet. All of them. Every. Single. One. That’s right, buddy. Keep things in perspective. 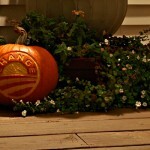 It begs the question, though: is it wrong to wedge a political message in between the cracks of a seasonal celebration? Is it crass to politicize an otherwise strictly non-partisan festival? Maybe… but not this year. This year there’s too much at stake. Too much at risk. And too little time to *not* get the message out there, to let folks know where you stand, and that you think it’s time for a change.